Are you sure you're eating enough veggies? 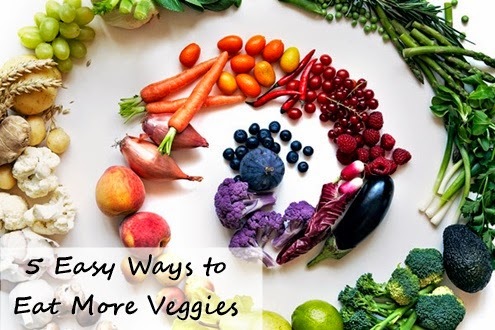 According to MyPlate, adult women should eat 2.5 cups of veggies every day. If that seems like a tall order, here are simple recipes and ideas that will help you cram more veggies into your snacks and meals. These fudgy vegan beet cupcakes from The Minimalist Baker are made with 1/2 cup pureed roasted beets. They were a hit with the kids at the Memorial Day yard party and with the adults at my Buddhist discussion meeting. Not too sweet, but no taste of beet. Need even more veggies? These kid-approved cucumber and hummus cupcakes from Food Heaven Made Easy are made entirely of veggies. Add veggies to your tofu scramble, omelet, or savory oatmeal. Have a side salad or vegetable soup with breakfast too. Add veggies to your smoothies. I am so inspired by Raw Family's 15 Green Smoothies recipes. They went beyond the usual suspects of kale and spinach to include other veggies: herbs (parsley, basil, and cilantro), leafy greens (chard, lettuce, and collards), celery, peppers, carrot tops, and even onion! They also made a kick a** video with funny costumes! I love pesto on pasta as much as the next guy, but it's also good on soup, stews, scrambles, omletes, and other entrees. Start with my vegan parsley almond pesto recipe and feel free to substitute the parsley with broccoli, beets, carrot tops, or whatever veggie you have on hand and substitute the almonds for walnuts, sunflower seeds, or your favorite nut or seed. Pesto freezes really well, so make a big batch, freeze in smaller containers or ice cube tray, and defrost as needed. Keep your freezer stocked with veggies. With veggies in the freezer, you'll always have veggies on hand to throw into a stir fry, soup, or entree. No excuses. Frozen veggies can be just as healthy as fresh ones (if not more so) because they are frozen at their peak and usually within a few hours of being picked. If you belong to a CSA or have a garden, you can freeze your excess veggies. Read these 10 Tips for Freezing Vegetables. How do you cram more veggies into your daily diet?